Discover the best that Bangkok has to offer on this full-day private tour of the city. 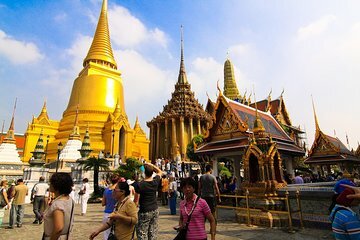 Visit all of the must-see attractions such as the Grand Palace, Chinatown, the vibrant flower market, Wat Pho, Wat Arun, and much more. Learn about the city’s rich history, religion, and culture from your informative guide as you drive around Bangkok in a comfortable, air-conditioned vehicle. This was an amazing day trip. Our personal tour guide Peter was extremely personable, knowledgeable and hospitable. He anticipated all of our needs, providing water often without us even asking and was happy to take hundreds of pictures for us (my wife is obsessed with photos so this especially made her happy). We felt we were able to see and experience so many sites in such a short time without ever feelings rushed. The trip was very well organized and the transportation between sights was highly efficient. You get a lot for your money. We would highly recommend this trip to anyone who wants to get the maximum out of a day in Bangkok! Peter also took us to a phenomenal lunch that was in a nice air-conditioned and trusted place to eat. The pad thai was the best ive had so far! He then took us for freshly made coconut ice cream that was magnificent. I can't say enough how nice and helpful Peter was!! I booked this tour to make the most of our first day and limited time in Bangkok. Our guide Chan was extremely patient as my mother who I was traveling with is a bit older and needed time to get from place to place and the comfort of the transport and private guide were ideal for us. Chan was knowledgeable and effective as a guide. He was ready and willing to tailor time at each stop and we packed a ton into a long day. I would recommend this private tour for those who want to see a lot of sights in s short period of time and feel secure with a guide and nice comfortable transport. We were picked up (on time) by our Guide Toon and her driver. What followed was an amazing tour of the major temples in Bangkok with a wealth of information from our Guide. Toon, a lovely friendly lady, not only gave us the history of each of the sites, but passed on an extremely interesting discussion on the fundamental basis of Buddhism that helped with understanding the why and how of the sites we visited. The visit to China town markets was fantastic, again supported by great information from Toon. In all a long day, but one of the best experiences we have had on many holidays. This is an absolute bargain of a day out. We have used Viator several times for many activities across the world on various holidays. This is the third private tour we have booked (Bangkok, Valencia and Venice) and everyone has been supported by excellent guides. They seemed to have got it right. Best tour ever. Our tour guide was sharp and had a very Big personality. He walk super fast and was very determined to help us avoid the crowds. He took his time to take awesome pictures and gave us enough inside of the history of the places to help us admire the buildings. I have travel a good amount and I highly recommend private tours like this one to see the touristic places and not feel like cattle in a big group. Waking up early has it perks when it comes to travel and avoid big lines in Thailand main attractions.